What should I wear to host a dinner party at home? There are a million things to consider when hosting a dinner party—from the menu to the ambience—but one very important element is what you, the hostess, is wearing. The right outfit will not only woo and welcome your guests, but also ensure you are confident and at ease in your undoubtedly stylish abode. Here are two hosting looks that will surely be the talk of the table. Wear a tea-length or floor-length gypsy-inspired dress in a flowy fabric that can swing and sway with you as you shimmy around the house. 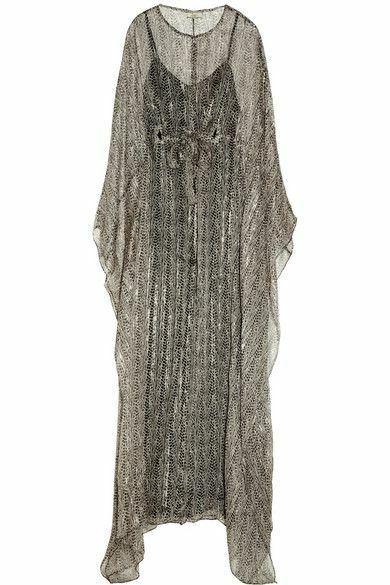 Think long caftans or hippie dresses with voluminous sleeves and full skirts in saturated hues or pretty ethnic prints. Pair your dress with flat sandals that have a little shine or sparkle and layer on a handful of dainty necklaces, bracelets, and thin rings for some effortless, yet very personal, charm. Elevate a quintessentially casual look of flattering jeans and an easy button-up with either a statement necklace or an over-the-top pair of earrings. Style a loosely tucked, oversized silk blouse—in creams, burgundies or special, quiet prints—with a snug-fitting skinny or cool wide-leg jean. Make sure your jeans have some stretch, as you want to be comfortable while sitting, standing, and serving. Look for necklaces that have weight and substance with perhaps a mix of metals and stones. The earrings should be slightly dressy, long, and with a graphic, bold feel. (Try a fringe!) A chic pointy flat will finish the look and ensure all-night comfort.